Motocard Kawasaki man David Salom secured his first ever World Supersport pole position for tomorrows 21 laps race. The Spanish rider has been a contender in all the sessions and timed his run to pole perfectly at the end of the session. Hannspree Ten Kate Honda rider Fabien Foret had to settle for second position after setting the pace earlier in the weekend and is expected to fight for the win tomorrow. Sam Lowes continued his seriously impressive transition from British to World Supersport by securing third place and a position on the front row of the grid. The 20 year old Parkalgar Honda rider said: “I’m really pleased. As a team we’ve worked really hard and this morning I did two pretty long race runs. We’re working a lot on tyre life and from the times we’re doing when the tyre goes off we’re in good shape. Broc Parkes onboard the second Motocard Kawasaki rounded out the front row of the grid. Chaz Davies was unhappy with his qualifying performance but the Yamaha man will still line up on the second row of the grid in eighth place. 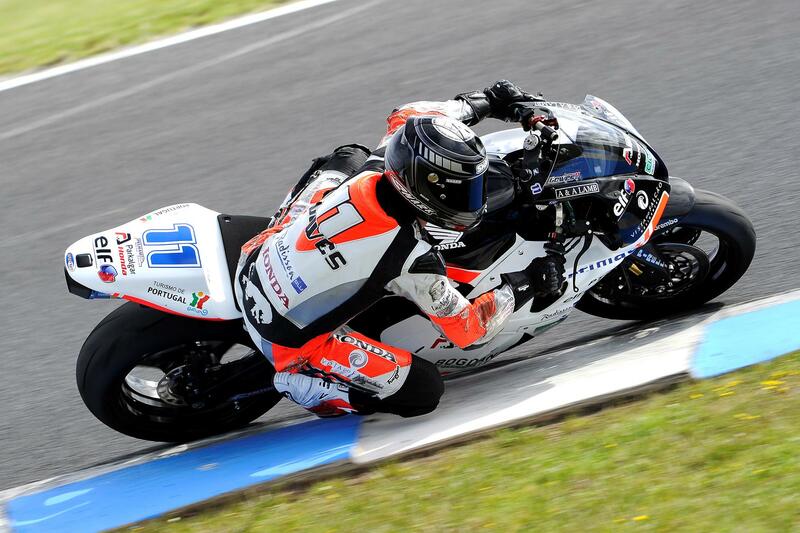 Gino Rea finished the session in 10th with James Ellison in 11th.